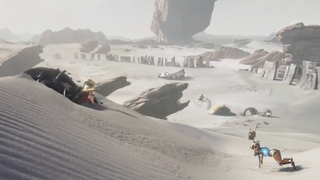 Recore is about a girl and her robo dog, and it’s a brand-new exclusive “franchise” for Xbox One. We’ve been waiting Armature Studios, comprised of key creative members behind Metroid Prime, to work on something ambitious and new. Apparently, this is that game. Previously, they’ve mostly worked on porting games. We don’t know much else about it, but it’s also looking pretty cute!